Eating from the various food groups is one way to ensure you eat healthier and get the nutrients you need. You probably remember the food pyramid from the USDA which has been around for many years. This pyramid introduced us to the different types of foods to eat. The guideline also gave us recommended servings of each group for specific ages and gender. While this has been a great guideline for many years, it's now been replaced by the "MyPlate" concept. 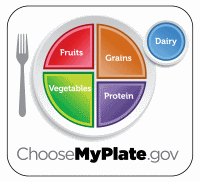 The MyPlate is more of a visual of how much you should be eating from each of the 5 groups of food. It's a great representation of not only which foods to eat, but approximately how much of these foods should be on your plate. While oils are not part of the different groups, it is discussed in this article as well. There is a certain amount of oils you want to get within your daily diet. The concept of the plate is to help you visualize how much to each from each of the groups. Basically, you want to fill half you plate with fruits and vegetables, with slightly more veggies than fruit. The other half of you plate would be filled with grains and proteins. You want to have a bit more grains on this half and slightly less proteins. The last food group is the dairy group. This is shown off the plate in representation of a glass of milk. To explore each of the different groups, go to the next page. The first page in this series will cover the fruits food grouping. Here are some recipe ideas to help you get in all the foods from each of the groups. Start your morning off with some dairy, fruit and grains all in one recipe. Use Greek yogurt to get in some extra protein. This is a creamy delicious way to start your day. Here's a twist on a recipe using mashed cauliflower instead of potatoes. This recipe idea can be used as a snack or a meal. Kids love hot dogs and it's a great way to get their veggies in with this meal. This is a fun and yummy way to get in your fruits without the added calories of ice cream. Made with fruits, low fat yogurt and granola, you also get the dairy and grains food groups in with this dessert idea. This is a great meal to get your proteins and healthy fats in for the day. This is broiled and not fried so it is a light yet flavorful entree. Add a tossed salad to get in some veggies. Learn how to properly read food labels to ensure you get in the recommended amounts of all the foods groups. Food labels can be a bit tricky, but with this article it will be easy. Use these tips to ensure your plate is a healthy plate. Eating healthy can ensure you get the right amount of nutrients with each meal. Reduce the amount of fats you get by changing your cooking methods. Read this article for tips on cooking with less fats and oils.